Okay so #1. Jaipur isn’t really pink. 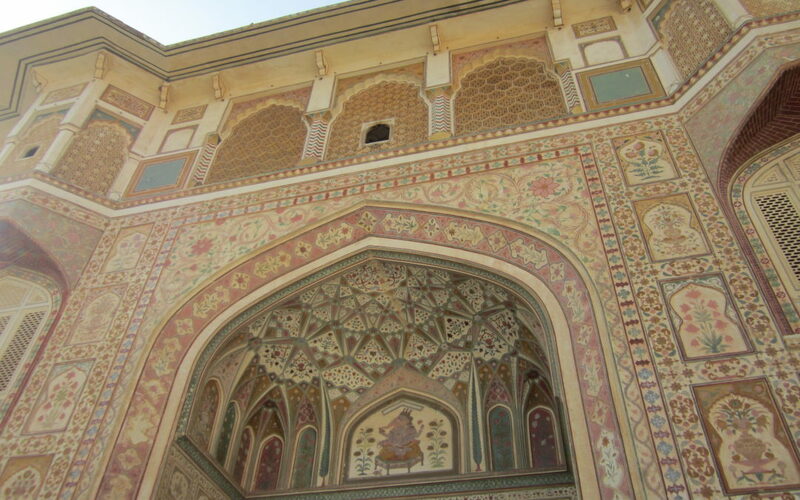 It’s called the the Pink City because in 1876, the Prince of Wales and Queen Victoria visited India on a tour. Since pink denotes the colour of hospitality, Maharaja Ram Singh of Jaipur painted the whole city pink to welcome the guests. #2. I didn’t really see much of the city. Jes and I needed a break from the touristy things so instead we did Western things. (I love how “Western” means “stuff white people like” in India, but from a West Coast perspective, it means “cowboy”). First, of course, though, was the Fort. 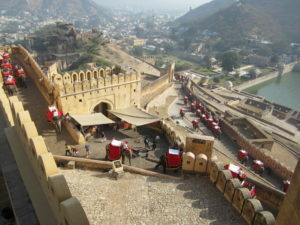 There are many forts in India. Jes got sick of the forts. But this one at least had elephants. I think they have a pretty boring life though because they just walk up and down this steep road from the bottom of the hill to the courtyard. They work half a day. I hope they are treated okay. 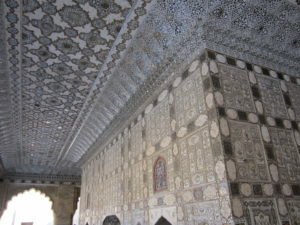 The coolest part of the fort was the hall of mirrors, apparently created in honour of womens’ vanity? Is what I figured from what the guide said. Who then took my photo. We were told not to pay attention to the snake charmers. OMG I thought, there are snake charmers? But they are bad people who take the poison from the snakes and are mean to them? So of course we saw a snake charmer and I tried so hard not to look but I was so fascinated. I snuck a peek out of the corner of my eye and the snake was so SHINY. 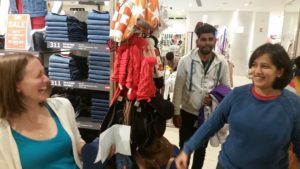 The next day we went shopping at the MALL with our tour guide Api to get her a shirt and for Jes to get stuff too! We ended up at Fab India which is actually a clothing store with a Western-inspired Indian style developed by an American. Jes found a really cute shirt. I tried a few things on but didn’t end up buying anything. 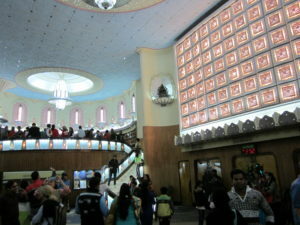 Then the highlight of Jaipur was the Bollywood movie! We were kind of expecting dancing and singing and crazy costumes, but instead it was an Indian Disney production (who knew!?) called Dangal. Based on a true story about an Indian girl who made it to the Commonwealth Games wrestling. Even though it was in Hindi with no English subtitles, we could follow quite easy with a few tips from Api on plot developments. During the Indian National Anthem everyone in the audience stood up … very patriotic! And during the movie the anthem played and everyone stood up again! In between, they were playing games on their smart phones and even taking calls during the movie! Some guy tried to take my photo with his phone and Api got mad at him. He did it anyways.